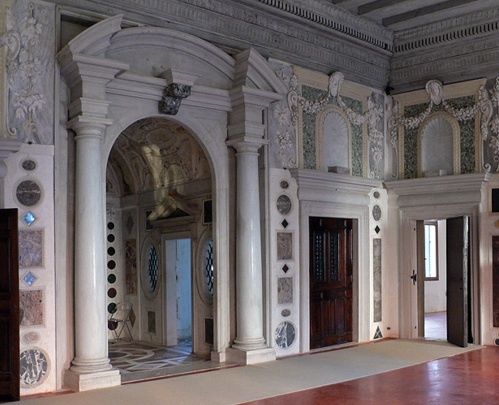 Once home to the Doge Antonio Grimani and the Patriarch Giovanni Grimani, this palace was enlarged in the 16th century, reputedly by Michele Sanmichele, to house the Patriarch's celebrated collection of classical antiquities and art (now housed in the Museo Correr, the Museo Archeologico and the Biblioteca Marciana. Unlike most palazzi in Venice, this one has an inner courtyard, but what makes it worth a visit (even if there isn't a special exhibition) is the lavish mythological frescoes and stuccoes and marbles that Grimani commissioned to set off his antiques, bringing in painters from Rome to paint in the 'antique style' fashionable after the discovery of Pompeii and the grotesques in Nero's Golden House in Rome: Francesco Salviati, Giovanni da Udine (Raphael's pupil) and Federico Zuccari. The palace became famous as a residence museum, one of the must-sees for illustrious visitors to Venice (including King Henry III of France in 1573) and later for Grand Tourists. After a major restoration, it was re-opened to the public in 2011. You can also see it at the very end of the film Don't Look Now, as the spot where Baxter (Donald Sutherland) finally caught up with the little red-coated figure that turns out not to be his lost daughter, but a psycho midget.